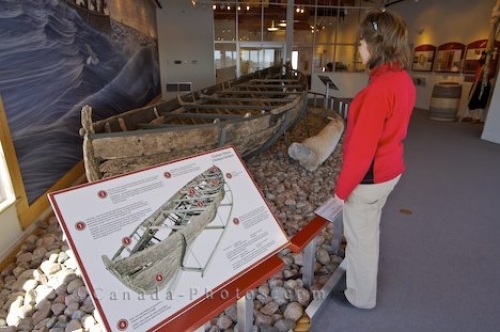 The Red Bay National Historic Site of Canada has a fantastic Interpretation Centre where tourists can see what an old whaling boat looks like and read up on the information provided. An old whaling boat, known as a Chalupa, is what this tourist is looking at as well as the large whale wall mural that is displayed in the background. Chalupa, small boat used to hunt whales, large wall mural of a whale, at the Red Bay National Historic Site of Canada Interpretation Centre, Red Bay, Strait of Belle Isle, Viking Trail, Trails to the Vikings, Labrador Coastal Drive, Highway 510, Southern Labrador, Labrador, Atlantic Canada, Canada. Model Released. Picture of an ancient whaling boat exhibit at the Red Bay National Historic Site of Canada in Southern Labrador, Canada.